Last night we settled down in front of the TV to watch the film Home. It’s the story of a family who live in a peaceful rural setting. The kind of family that plays roller hockey at night on the expanse of tarmac – an unfinished and thus far abandoned motorway – in front of their home. The fragile mother (played by Isabelle Huppert) stays at home while the DIY-prone father (Olivier Gourmet) works. The eldest daughter spends all day lying outside on a sun lounger listening to heavy metal music while the two younger children go to school. On the surface it’s a calm existence, but the shadow of the motorway and its potential for disruption is never too far away. The film follows the family’s reaction to the reopening of the highway, and the toll the traffic takes on their mental and physical health. Some have described Home as a black comedy. Personally, I found more darkness than laughs in the 93 minute film. The distress quickly spreads across the household. Each person reacts differently. But the net result is that we watch the family choosing to become more and more reclusive and shut in as the traffic builds up outside the front door. (There is practically no dialogue between family members and people in the outside world throughout the entire film.) Stir crazy, they are ill-equipped to tackle the problem. The saddest point comes near the end of the film when the family’s isolation leads them to miss out on an opportunity for reconciliation. It was pointed out to me that Home is really a giant allegory for what can happen to anyone facing difficult issues. Running away from a problem – or, as in this case, just burying your head in the sand – does nothing to alleviate the stress and deal with the predicament at hand. Fear is contagious; paranoia is infectious. Directed by Ursula Meier, Home is a beautifully crafted film, with superb cinematography to accompany the bleak plot. The Swiss (French) film has been picking up awards at festivals and is well worth seeing in a cinema or on DVD. If there was to be a list of core competences for political parties, communication would have to be up there in the top three. For a lot of the time, politicians seem to be keen to justify what they're doing and the positive/negative impact it's going to have on our lives. And every few years - more often in Northern Ireland - parties go through a focussed period of pleading with voters to choose them above the other parties on the ballot paper. It's all about communication. Of course, party manifestos often bear little relation to the democratic body they're seeking election to - eg, very little mention of Europe in most of the NI party literature last June. And given that few NI parties end up in control of an institution, individual parties often have little influence, and there is therefore little match-up between the manifesto promises and the decisions taken. If you were a relatively new party, aiming to capture the hearts and minds of East Belfast voters by holding a public meeting, would you leave the time off the press release? TUV - nul points ... pour la communication. And that's before the questions about why they've chosen to have a public meeting in an Orange Hall, whether they're paying the market rate to use the premises and what people will perceive about the links between the Orange Order and the TUV. However, answers to those questions and more should probably be discussed over on the thread on Slugger O'Toole. Oh, and the public meeting's at 8pm. [Gerry Lvs castro] Just to put this in context, the only orange hall most people in NI (including many Unionists) have ever set foot in is the one in the Folk Museum. If ‘all are welcome’ would a more neutral venue such as a hotel not be more likely to gain you a wider audience? [David Vance] If unionists are unhappy to enter an Orange Hall then that is going to have to be a risk we take. I do understand your point and it is fair enough but we are where we are and as best I understand no one is required to wear a Sash. Further Update - The TUV did issue (on Thursday) a subsequent press release listing the start time, but still didn't update the previous one on their website. Stop motion animations seem to be everywhere. We've used it at PCI Tech Camp for the last couple of summers as a quick and fun way of exploring the techniques that you need for any kind of film-making. Photographer Eyal Landseman took 2,231 photos to create the music video that accompanies Oren Lavie's song "Her Morning Elegance". And the video has now received a 2010 Grammy Award nomination for "Best Short Form Music Video". What the Apple iPad tells us about technology evolution and miniaturisation! 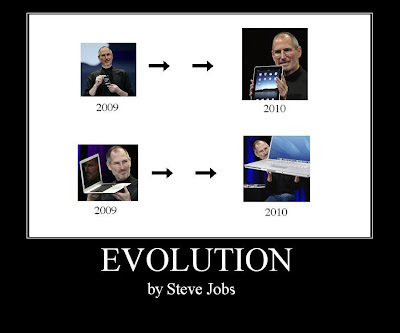 I wasn't going to mention the new Apple iPad, but then I stumbled across this evolutionary slide! It shouldn't come as a surprise that compared to the latest iPhone 3GS handset (16GB is around £450 Pay As You Go), the iPad seems relatively cheap (16GB/wifi iPad likely to be priced about £390, with the 3G version an extra £100). The iPad's larger display is obviously more expensive, but that is offset by all the extra room inside the case that negates the need for component miniaturisation. And the 3G version of the iPad comes with Assisted-GPS, which should allow for some comedy-sized car mount kits! At the moment, the iBook Store will only work in the US. Will be interesting to see how quickly international deals are put in place with publishers, and whether it's possible to import in ePub books that haven't been purchased through the iBook store. Of course, the notion of an Apple iPad wasn't entirely new ... and Apple's PR department obviously took a risk that we'd get over the iTampon jokes quite quickly (and they'd be able to sort out the trademark issue with Fujitsu). Open Arts Community Choir were on stage at lunchtime as part of the Out To Lunch Arts Festival. Wow. They bring a smile to your heart and a tear to your eye. "Inclusive best describes the Choir. It features people with disabilities and those without, from every section of the community. The age range is extensive, from seventeen to over seventy. Blind people work alongside people with mental health difficulties and people with learning disabilities. The members are united by their love of song." Signing the songs as well as singing them added a whole new layer of interpretation. While they should be judged as a choir on their musical abilities, I found it impossible not to be additionally bowled over by their get up and go attitude and achievements. Blending voices together, countering many forms of disability - visible and invisible - coordinating singing in parts across sighted and unsighted singers, and making it look like it's the best feeling in the world. Another great lunchtime event from the Out To Lunch festival. There are a handful more events running in the Black Box this week. Check out their website and booking page for details of what's left. And the addition of yoghurts to the free lunch is a wonderful extra. Tonight’s meeting of Lisburn City Council was surprisingly well attended this evening. Jeffrey Donaldson (MP and MLA) and Edwin Poots (MLA, Minister for Environment) both made it. However, the UUP’s Basil McCrea and Alliance’s Trevor Lunn (both MLAs in “another place”) were absent ... perhaps involved up in party discussions at Hillsborough. The council meeting opened with fulsome tributes from each party to Councillor Peter O’Hagan who had died just before Christmas. All parties agreed that he was sharp, detailed, well prepared, generous with his time and more committed to public service than most. While many may at times have disagreed with his stance and style (including his own party by their admission) they all felt that the council was poorer without him. In every Lisburn council meeting I’ve attended, there’s a school boy atmosphere and a feeling of pantomime that quickly descends into a lack of respect for councillors from other parties. The UUP and DUP mock each other, but gang up to heckle and jeer councils from Alliance, Sinn Fein and the SDLP. While tributes were still being delivered by other parties, one DUP councillor was passed a laptop with the Slugger O’Toole blog clearly visible across the screen and he spent the next while staring intently at the screen. A party colleague flicked through a magazine. Much later, another colleague checked out the BBC Sports football results! These are public representatives (some of them holding down multiple public jobs) being paid public money to serve their constituents ... and perhaps even pay attention during the bits they find boring? Councillor John Drake gave his maiden speech, thanking the other councillors for unanimously backing his co-option (rather than forcing a by-election as will be the case as Castlereagh Borough Council seek to replace Iris Robinson). He was notably open-necked and tie-less ... in notable contrast to all the suited and tied men around the circular council chamber. Will be interesting to see he eventually conforms to the prevailing dress code, or continues to fight for SDLP informality! The mayor visibly disapproved with this analysis. There was criticism of a tourist initiative that saw the city of Belfast running street promotions in Lisburn over the Christmas period. The Economic Development Committee will be writing to ask if Lisburn can promote itself in Belfast! A dearth of information about Lisburn in Northern Ireland-wide tourism literature was raised by Councillor Tolerton. She’s obviously not looked at Lisburn Council’s own tourism website that has a look of tumbleweed at the moment. After council intervention, £1.6million of rates bills have been issued to vacant properties that weren’t actually vacant “allowing the rates burden to he shared out more evenly”. The insinuation was that people were informing Land and Property Services but still not being sent bills. SDLP Councillor Heading is upset that the Library Authority has £100,000 set aside for marketing, but has not yet produced a marketing strategy. He sees them prioritising the closure of libraries over the promotion of their services. Oh, and they squeezed in a couple of jokes about the DUP taking over the UUP. Last Thursday saw several hundred people scoff the available nibbles and pack into the crowded Reception Hall upstairs in the newly refurbished City Hall. Architects, planners, community workers, ratepayers, and even the odd Flip camera-wielding blogger gathered to listen to the launch of the Forum for Alternative Belfast’s analysis of the city’s potential. 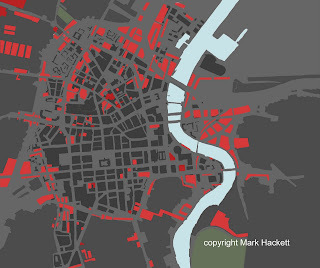 You might remember news stories during the summer about a group of architects and planners getting together for a week long summer school to draw up a map of Belfast’s empty land. The participants found that around 32,000 people live within a 15 minute walk from the city centre with 73% of them living in rented accommodation. But conservative estimates suggested that the 265 football pitches worth of vacant land could support at least additional 50,000 people in the central city, without resorting to high-rise buildings or creating a concrete jungle with no green spaces. The video highlights some of what was conveyed during the launch meeting that was kicked off by Belfast’s Lord Mayor Naomi Long, featured input from Ken Sterrett and Mark Hackett, before being wrapped up by Belfast City Council Chief Executive Paul McNaney. There was a lot to take in and think about. Over the last 35-50 years, people have been moving out of living in the centre of Belfast. Yet the city centre population doubles each week day as commuters travel in to work. The Council’s Chief Executive was quick to point out that bringing more people back to live in the city would boost the rates the council can collect to subsidise the daytime migrants. Those speaking steered clear of demonising cars. But they insisted that they should be managed and used for good. Free up land wasted on flat car parks – one example was at the recent Gas Works development off the Ormeau Road – and instead allow cars to park along the side of the road. Stationary cars can protect pedestrians from the noise and the danger of busy roads. Waste ground together with expanses of ground level parking can host criminal activity and certainly make passers by feel fearful. The Forum criticised some of the buildings that have been erected over the past 35 years. In particular, some social housing schemes were singled out as poor use of public money that created dysfunctional spaces. Yet Mark Hackett was willing to admit that the very architects and planners who were backing the Forum for Alternative Belfast were guilty too. The Forum is independent of statutory bodies. It’s a set of expert but outside voices pitching in ideas to the public square on the potential that Belfast could realise if it grasps the “fill up” strategy. Of course, while bringing 50,000 people back to live in the city centre could make a massive difference to Belfast, it would also have an effect on the outlying commuter towns (and city). It could partially relieve the housing pressure in Bangor, Holywood, Lisburn, Dromore, Banbridge. Yet it would cement Belfast’s commercial dominance and cast an even darker shadow over it’s smaller provincial rivals. Good for Belfast? Not so good for everywhere else? Whatever the answer – and no doubt you’ll let me know what you think in the comments – the Forum for Alternative Belfast has built up an impressive head of steam with its credible arguments for changing the planning assumptions and public perceptions. Good luck to them. As I discovered before Christmas, Northern Ireland political party conferences are funny affairs. The most enthusiastic members turn up to listen, applaud, vote (generally en masse), pick up a stash of free pens, chat to old friends and eat. I imagine that most go away quite tired, feeling good about their party but not having changed their minds on many policy matters. It is obvious that the arrival of the media – in particular, live streaming on BBC News website – has sharpened up conference time keeping and changed the agendas to talk to the people outside the conference hall as much as the people inside. Members of the Alliance Party followed their traditional route this morning and turned up in bigger numbers than normal at the Dunadry Hotel outside Templepatrick. Arriving late, as I pulled off the main road and up in towards the hotel, I was greeted by cars parked in the verge on both sides of the lane, the overflow from a packed hotel car park. During David Ford’s leader’s speech, the main conference auditorium was packed, with every seat filled by delegates and interested stall holders from the exhibition areas. There were a fair number of younger faces in the audience. The leader’s speech was really the sandwich between a set of motions that the conference was debating. Young people not in education, employment or training – calling on the Departments of Employment and Learning to partner with the Department of Education to address the fifth of 16–24 year olds not in education, employment or training. The mood of the conference seemed upbeat and confident. 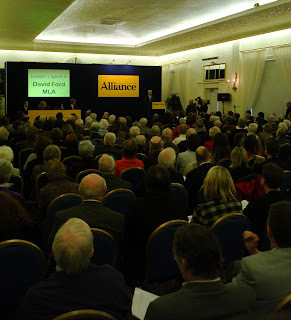 David Ford’s speech – at nearly 40 minutes long, perhaps it should have been described as a lecture – ticked a lot of boxes. Update - You can now watch it on the BBC website. 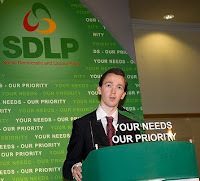 Also check out Mr Ulster's blog posts and videos of the speeches. He referred back to the party’s beginnings and its early members, including Oliver Napier and Bob Cooper. “Just forty years ago this year, a group of people had a dream. They came up with the ludicrous idea that politics in Northern Ireland should not be dominated by division, but should be about co-operation, partnership and reconciliation. The sceptics had a field day. How could such a naïve bunch of do-gooders have any prospect of success? The notion of overcoming tribal politics was preposterous. Commentators generally predicted that a party founded on such principles could not survive a single election. He paid tribute to elected representatives, in particular drawing attention to the four Alliance councillors in Castlereagh. Lagan Valley’s Trevor Lunn was thanked for his role in chairing the four party talk on “the transfer procedure debacle” while the party’s deputy leader Naomi Long was singled out as “the epitome of what a public representative should be”. Commenting on the dissident attack on Constable Peadar Heffron just a few miles from the hotel, Ford reflected on the reasons why he was targeted. Ford also led his audience on a short bus tour of stately buildings. Coming to a screen near you ... Belfast City Council? One night back in early December I posted about Niall Kelly’s suggestion that Belfast City Council should start streaming its meetings online. “I am very happy that the Policy & Resources committee has backed my call to stream council meetings online. Belfast City Council has a reputation as a progressive Council, which has led the way in taking informed, transparent decisions which provide the public with as much information as possible and today’s decision has shown this. So while some councils still don’t publish their council minutes online (or have just started), and while the councils in Lisburn and Castlereagh wait to ratify their joint committee’s decision to publish minutes of their transition meetings, Belfast are forging ahead – in principle at least – with a new chapter of transparent, accountability … and perhaps also a painless way to drift off to sleep in the comfort of your own house if you end up listening in to a boring meeting! 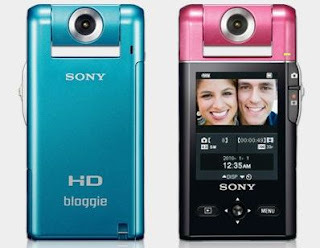 So how are they different from the well known Flip cameras? (By the way, other people swear by Kodak’s offerings.) The embedded video will be a lot more amusing than my description below! Looking no chunkier than the Flip Ultra cameras (thicker than the slimline Flip Mino) the PM5 features a retractable USB arm, tripod mount point, 4x digital zoom and uses SD/SDHC as well as Memory Stick (PRO) Duo cards for storage. The NP-BK1 Lithium Ion battery is rechargeable (via USB) and also removable – best of both worlds. According to Sony, an 8GB memory card (not included) would hold a fair amount of video: 1080/30p = 80 minutes, 720/60p = 160 minutes, 720/30p = 240 minutes,VGA/30p = 480 minutes. The unique selling points are a top mounted lens that swivels 270 degrees, allowing you to film forwards as well as backwards. (Filming yourself? Weird!) The even more unique selling point is that the PM5K comes with a 360 degree attachment that plugs on the top of the swivel lens. 360° Video recording lets you capture the world around you. Just attach the included 360° Video Accessory to record a high-quality, panoramic video that encompasses a 360° field of view. Once you’re done shooting, you can play back your 360° videos with the included Picture Motion Browser software [requires Windows XP SP3, Vista SP2 or Windows 7; not supported by Mac OS], as well as share them over e-mail or upload them to popular video sharing sites. The jury’s out on whether 360 degree is just a gimmick or actually a valuable feature. I can’t find any examples of the output – not even from Sony – and the one review I’ve seen that actually mentions using the 360 degree in anger, explained the reviewer’s disappointment with the quality of the 360 degree imaging. But I’d love to try it out to see for myself. 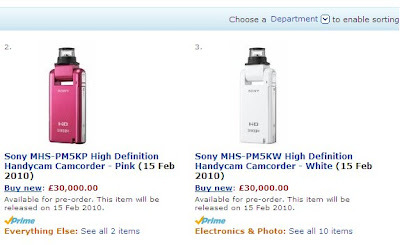 Some of the models are listed on Amazon UK as being available from mid-February, though the pricing hasn’t been fixed. More widely, it’ll be interesting to see how pocket-sized HD video cameras develop over the next 12 months. Flip were bought over by Cisco, and it would be no surprise if their range of cameras started to take advantage of wireless network connectivity. Meanwhile Sony are introducing swivel lens and panoramic views with the Bloggie. And other manufacturers are starting to take sound seriously, and add external mix sockets to compensate to the poor quality/low level audio on some of today’s cameras. I read the headline and thought: Susan Boyle, a woman of considerable talent. 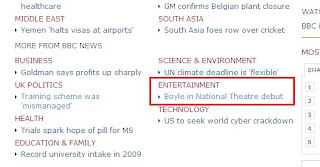 Then I clicked on the link and discovered the story was about director Danny Boyle, better known for Sunshine and Slumdog Millionaire than Britain's Got Talent! The results of the Review of Public Administration were published in November 2005 and March 2006. The review included health, libraries, education and local government. 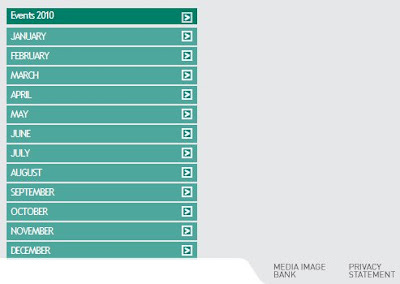 In April 2009 the old eleven heath trusts were reduced to five. The single Library Authority took over bookish responsibilities from the five education and library boards in April 2009. The remaining functions of the five education and library boards were to be replaced with a single Educations and Skills Authority (ESA) this month, but that has run into problems. By May 2011, there is a plan to reduce the number of local councils from twenty six to eleven. Voluntary transition committees made up of members of the affected merging councils are up and running. However the legislation to give them statutory powers and enable the May 2011 switchover is under pressure due to boundary disputes. The voluntary transition committees have been meeting monthly. With the possible exception of disputed areas around the fringes – important, but disputed, areas – Lisburn City Council and Castlereagh District Council will be merging. The Castlereagh/Lisburn committee will be working through issues around the delivery of public services as well as property and staffing. As the transition date approaches, more and more decision-making responsibility is being pulled away from the two separate councils and being put into the hands of the combined committee that can take a collective and strategic view of the future merged operation. So the transition committees are not without clout and power. The Department of the Environment’s Local Government Policy Division oversee all of this. Recognising the importance and significance of the decisions that will be taken by the voluntary (ie, non-statutory or pre-legislation) transition committees, they issued guidance on reporting, transparency as well as setting the allowances that are paid to councillors serving on these responsible bodies. Transition Committees will be subject to the accepted norms of internal and external scrutiny. They will operate to best practice in management of meetings, reporting arrangements and general administration. The terms of reference for Transition Committees provide advice on meetings, agendae, and reporting. In particular, the terms of reference state that ‘minutes of meetings will be in action format listing key decisions and actions to be taken and will be prepared by the Secretariat. Copies of such minutes should be submitted to the Strategic Leadership Board.’ The Strategic Leadership Board and Department of the Environment will require regular reports on transition progress for the effective coordination and strategic management of the reform process. The Terms of Reference set out the responsibilities of a Transition Committee. As these responsibilities will constitute an important role for the Councillors appointed to Transition Committees they will be paid from the DOE allocated block grant an agreed supplementary allowance for the additional responsibility involved. The amount proposed is £2700 pa, in parity with the Strategic Leadership Board and Policy Development Panels. Members appointed to Transition Committees should have the time, capacity and commitment to contribute effectively to the development of new Councils. In addition, expenses may be claimed and travelling will be paid in accordance with the rates determined by the Department under the Local Government (Travelling and Subsistence Allowances to Councillors) (No 2) Regulations (Northern Ireland) 1973, as amended. And Castlereagh District Council don’t publish minutes of any council business online – though that might change with the level of scrutiny they’re under following the allegations made against a councillor in the recent Spotlight programme! Given that Lisburn has eight councillors appointed to the transition committee, each being paid £2,700 per annum for the privilege – that’s a shade over £21,000 of public money being handed out, plus the same again for the Castlereagh councillors involved – it seems reasonable that ratepayers should have some idea of what they’re up to. I attended the launch of Pete Rollin’s second book The Fidelity of Betrayal: Towards a Church Beyond Belief and quickly read the first handful of chapters. Eighteen months later I’ve still to finish the book! His next book, though, is much more accessible and I completed it a matter of weeks after I got hold of a copy at an Ikon gathering. “Parables subvert [our] desire to make faith simple and understandable. They do not offer the reader clarity, for they refuse to be captured in the net of a single interpretation and instead demand our eternal return to their words, our wrestling with them, and our puzzling over them. There is much celebration, but the members of the community are shaken. Their reason for following seems no longer about Jesus and his “radical life and supreme sacrifice”. Instead they worry that their rationale will turn inward and be selfish, “because his sacrifice will ensure their personal salvation and eternal life”. Sometimes, rather than create an entirely new situation, Rollins borrows from an existing gospel parable, and merely changes one aspect, often the opening line or the final punch line. In The Prodigal Father, the father steals away in the middle of the night leaving the two sons at home! This kind of adaptation throws off balance the normal dynamic of the reader’s understanding of the original parable and kicks off an explosion of ideas and questions. In general, Rollins’ doesn’t seem to be making new radical points with the stories. Instead he is reinforcing old truths. It may not be new, but it is still radical. Yet he returns to betrayal and freedom in the eponymous parable. In order for nurtured students to surpass their great teachers “a painful separation must take place between [them]”. The student will be asked to stop following the teacher and move beyond the lessons thus far learned. It’s a great book: accessible, could be read in short chunks, and it started to poke holes in assumptions that I’ve carried around for a long time. Questioning is good. Perhaps the more unsure and the less arrogant your faith, the stronger it becomes? As a bonus, I’ll post some audio in a day or two of William Crawley interviewing the author Peter Rollins (now published) at the October 2009 Ikon. Like many, I watched the first couple of series of the US television drama Lost while they were being shown on Channel 4, and then it disappeared into the dark abyss of Sky One and I watched no more. Turns out that there have now been five series and a sixth starting to air at the beginning of February. What have I missed? About 50 hours of my life watching Lost. The Lostpedia Blog has condensed the five series down to a manageable 8 minutes 15 seconds. (h/t to Lee Munroe.) It’ll ruin sales of boxsets! Suddenly even the first two series now make sense. Hopefully they’ll inflate it to a round ten minutes and add in what happens in the 18 hours of series six. RTE Storyland is a competition in its second year for film makers to win an online drama commission. In the first round, entrants had to submit the first two scripts along with a synopsis of the rest of the series, a budget (limited to €8,000 per episode) and a marketing plan. Six winners impressed the judges and were funded (I hope!) to produce a couple of episodes. Starting at the end of the month – 29 January – online audiences be able to view the first episode from each of the six successful shows and you’ll have a week to vote for their favourites. One show will be voted off, with the rest getting to live on for another week. The second episode will then go online, and the remaining five will face the public vote again. Daily Strife is through to the final six and is written and directed by Cecilia McAllister and produced by Mairin Murray. It’s the only show in the competition to be commissioned from a company operating in Northern Ireland. But better than that, it looks like a funny concept, and the first couple of episodes throw in snow balls as well as scary men with guns. Normal for this island, huh? If you like what you see, you can become a fan of Daily Strife on Facebook or follow them on Twitter, see behind the scenes, track their progress ... and be reminded when you can vote! And I’m sure Mairin and the team would be delighted if you were impressed and engaged enough to blog and tweet about it and spread the word. I’ll be following Glenn’s adventures, and Daily Strife’s progress – hopefully long and successful – on the blog over the coming weeks. Photo credits - Karl Burke. Ulster Museum - a help cord you'd never reach and an emergency door that doesn't look like it would open? So Littl’un and I retraced familiar steps on Saturday afternoon, walking up the steps, through the steel snail sculpture and into the sub-tropical climate of the Ulster Museum. Like all new buildings, there are obviously bits still waiting to be finished – like the scribbled writing on the walls above some of the projectors – as well as things starting to suffer from early life failures like one of the chair lifts. There’s something odd – perhaps alarmingly unsafe – about the glass doors at the far end of the ground floor. As the pair of us sat demolishing a healthy chocolate muffin, lots of people came up to the glass double doors and tried to push them open to get out into Botanic Gardens. But they just rattled, locked no matter which door people pushed. It was then that I noticed the fire exit sign hanging above the door, indicating that in the event of an emergency, straight ahead – through the locked doors – is a route out of the building. Except they’re locked. No push bar. Now some doors have fancy fittings that automatically fail open whenever an alarm is triggered. If this set of doors has such magic, it’s well hidden. (And normally such doors have a notice fitted to explain that they’ll open in the event of the alarm sounding.) Instead, it looks like these ones are locked and unlocked with a key. I did report it to a member of staff at the time – who looked quite concerned about it – so hopefully it’s fixed (or officially known to be magic) by now. Update - the door should have been open. I’m sure I’ll get told off for using the disabled toilet. But you try taking a five year old girl to the loo in the male toilets and squeezing two of you into a cubicle – or surviving the glares as you queue up and wait for one to be free! While in there I couldn’t help noticing the emergency pull cord. 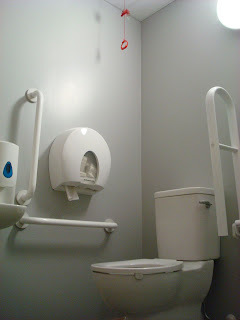 Update - According to the museum, "the pull-cord in the disabled toilet has been fixed – with over 170,000 visitors it’s hard to believe this hasn’t been spotted before." Other than that, Takabuti was still asleep in her case, William Crawley was booming out short talks from the video wall cycling through an abbreviated Blueprint programme, and while the Discover Art room had finally run out of Scully sheets to colour in, they did keep us entertained winding wool around cardboard to be stapled up onto their the display. 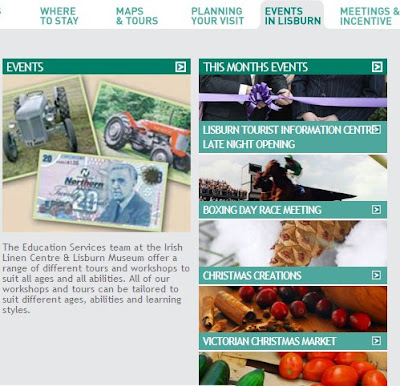 Visit Lisburn ... but is there anything on? On Saturday, I wondered whether there was anything child-friendly happening in and around Lisburn. While the Farmers’ Market is now on holiday until the spring, the city centre management company has been know to run events and activities for little people and their willing parents. It wasn’t yet time for the regular trip to the library, and while I could hear the Ulster Museum calling, it seemed a shame to pass up something fun nearer to home in the town city centre. 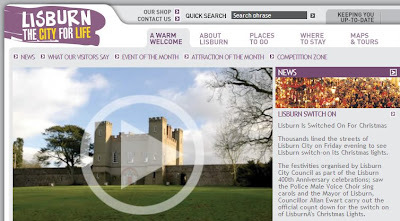 So off to Lisburn City Council’s tourism site – visitlisburn.com. Boxing Day race meeting, Christmas Market, ... no. Seems a little out of date. Up at the top left there’s a link to Events 2010 and then January 2010. More than half way through January and it’s obvious: Lisburn must have abandoned culture and entertainment for 2010. Cost cutting? Blew all the budget on the ice rink? Forgot to ask someone to update the website? First event in the 2010 calendar is a Garden Show in Hillsborough between 21-23 May, and then you’ve got to wait until sometime in the summer for the Highland Games in Wallace Park. We went to the Ulster Museum and checked that the mummy was still sleeping! Update - 21 January - The Visit Lisburn website has been updated - restyled - though there still aren't any January events other than visiting Hilden Brewery which is a hangover (excuse the pun) from December! 2010’s Out To Lunch arts festival is now well under way. With lunch time events for £5 including lunch, it’s nearly cheaper than grabbing lunch elsewhere in Belfast and you get free entertainment thrown in. After the free opening show, comic Karl Spain was up on stage on the Thursday 7 January. Ten days later, I remember laughing, but can’t remember any of the jokes. 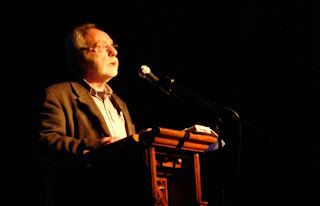 Last Wednesday Brian Keenan took to the stage to talk about his new memoir I'll Tell Me Ma. It was a unusual event, with Keenan spending at least the first half hour talking at length about the process of deliberating whether to write the book, before reading a few snippets. Keenan sees a difference between history (with its straightforward linear timeline) and memory (which engages you emotionally and spiritually). Despite initially having no memories of his life before the age of seven, he found that they weren’t “trapped in a black box” after all, but could be accessed as he remembered growing up with buck teeth, traced back his relationship with his circumspect parents and walked around Duncairn Gardens and Tigers Bay. Turns out that book ended up being written in a convergence between a place (his childhood streets in Belfast) that had gone and the imminent death of his mother. Keenan was losing the tangible foundations of his life. He described his mother as being in “the lulu land of Alzheimer’s”. Yet her condition brought her back to her childhood. And after years of growing up with parents who didn’t talk about their experiences, all the history that he’d wanted to know came out in her last months. For anyone reading this rambling post who was there at the event, you’ll remember Keenan talking about “Thunder Eagle”, a stone sculpture that he’d seen as a child and laterally spoke to him (no, not in a literal way!) as he questioned how to deal with his mother’s pending death. I got a shot of it as I walked back to work. 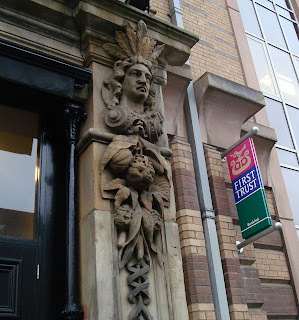 Belfast architecture is full of surprises just above eye level. 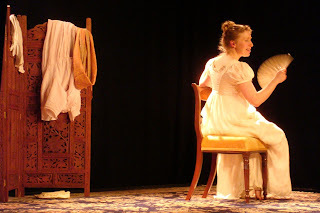 Last Thursday was a completely different experience with Rebecca Vaughan’s one woman show, Austen’s Women, rattling through female characters in Jane Austen’s books. With a nearly entirely female audience, and a very simple set, the corsetted Vaughan changes voice and dons shawls and dresses as she switches through thirteen characters in 75 minutes. I’ve never read (or watched – the modern way to read!) any Austen, and having listened to the show, I’m not inclined to start. But that’s not to detract from the fantastic range of 19th century feminist rants that were played out on the stage of Belfast’s Black Box. A great show, and worth going to hear if you find it on in a venue near you. With another 20 or so events (mostly musical) still to come, it still merits looking at the Out To Lunch website and picking up a few tickets for some diversionary lunchtime entertainment. At first the programme shone a light onto a little-understood hobby. Then it moved across to be social history and political intrigue as it examined the repercussions of Porter’s recording of army radio traffic (partially downloadable) on Bloody Sunday. And finally it switched to his personal story uncovering his past and finding out who his mother really was. The tapes – which provide a very accurate timeline of army activity on the day – were ignored by the discredited Widgery Tribunal set up in 1972 to look into the events of Bloody Sunday. Afterwards, Lord Widgery advised Jimmy Porter to destroy the tapes. Instead Porter gave the tapes to an fellow radio ham across the border and then endured years of the army searching his electrical shop and home … and years of soldiers pretending to search his premises but instead drinking tea and listening to opera! It seems like the Saville Inquiry was paying more attention to the evidence Porter’s hobby provided. An amazing story, and terrific radio. Well worth a listen - available on iPlayer until 13:30 on Sunday 24 January, and repeated on Radio Ulster at 19:30 on Thursday 21. Over the last ten days or so, the Northern Ireland news agenda has been dominated by the emerging Robinson-gate saga, revelations and clarifications around Liam Adams political involvement as well as a renewed focus on resolving the roadblocks (and parades) standing in the way of the devolution of policing and justice in Northern Ireland. This has squeezed the coverage that other news stories perhaps deserved. There have been a few developments around the Presbyterian Mutual Society which has been in administration since November 2008. I’ve mentioned PMS on the blog a few times before. The administrator’s eighteen month term runs out in May 2010. Sad news broke yesterday with the announcement that local entrepreneur and philanthropist Sir Allen McClay had died in a US hospital (where he'd got married in November at the age of 81). Qualifying as a pharmacist in 1953, he went on to establish Galen in 1968, floating the multi-national business on the stock exchange in 1997. Retiring as Galen's President in 2001, he was back in business less than six months later with a series of acquisitions that created the Almac Group. Throughout all of this, the Cookstown-born entrepreneur has maintained a business presence in Craigavon, and helped keep Northern Ireland on the international pharmaceutical and biotech map. Paying tribute, staff spoke warmly of the boss who ate alongside them in the firm's canteen. He seemed to have earned the intense loyalty of his staff and colleagues. Through the McClay Foundation (and before that, the McClay Trust), he also invested in local education - with multi-million pound donations QUB for Chemistry and Pharmacy education and scholarships, a research centre over at the City Hospital, and a £10 million contribution to the new central library. Hearing the news reminded me of a television programme a year or two back that profiled this humble and generous figure. And as if by magic, the Thinking Big programme that local indie Below The Radar made for BBC NI has been put online. Well worth a watch. Sir Allen McClay - one of Northern Ireland's giants. Update - the programme will be shown on BBC One NI after the Ten O'Clock News at 22:35 on Tuesday 19 January. Belfast City Council are commissioning a piece of public art for the City Hall “which reflects the Irish history and heritage of many of [its] citizens”. But that’s not the story. At the back of the issued Expression of Interest / Quotation document (which outlines the specification and contract conditions) there is an appendix with a form that applicants must fill out. Applicants must promise not to canvas or solicit support for their application from councillors (“members”) or council staff. I/We hereby certify that I/we have not and will not canvas or solicit any Member, Officer or Employee of the Council in connection with the preparation, submission and evaluation of this Expression of Interest or award or proposed award of the Contract and that to the best of my/our knowledge and belief, no person employed by me/us or acting on my/our behalf has done, or will do, such an act. 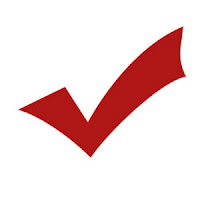 I/We hereby certify that, to the best of my/our knowledge and belief, no person who is a Councillor, Officer, Servant or Agent has any direct or indirect interest, in or connection with, the Organisation. Pity Castlereagh Borough Council didn’t have that in place when they were tendering for the Lock Keeper’s Inn café. Or maybe they did? Someone out there with a copy of the Expression of Interest advertised in January 2008 and re-advertised later that summer may be able to comment further. But a cursory read through the Castlereagh minutes doesn’t point to anything more elaborate or lengthy than a simple advert in a newspaper. And I’m not about to go and request a copy of the Expression of Interest just to prove a point! There’s going to be an election ... a by-election in Castlereagh East? There is a lot of talk about elections. Given that there have been 21 Northern Ireland-wide polls (plus one referendum) in the last 21 years, it’s no surprise that there’s always a lot of talk about elections. And of course, I meant to add that there's a council by-election in Craigavon today! Most people’s money is on a Westminster election being called on the 6 May. The mood music is surprisingly positive around the reinvigorated Policing and Justice negotiations (with no doubt a few other issues on the side of the main political debate) and perhaps the Assembly can motor on until Spring 2011 without collapsing into an early election. At some point this week, Iris Robinson is expected to resign her seat on Castlereagh Borough Council. (Update - I'm reminded that resigning from council has actually not yet been mentioned - only resigning as MP and MLA - though her husband did talk about her political career being over. Further update - She has apparently now resigned as MP, MLA and Councillor.) Normally parties try to avoid a costly by-election and get wider council agreement to co-opt a new member of the losing party onto the council. But will this happen in Castlereagh? No. It only takes one opposing vote to veto a co-option and trigger a by-election, and you can be pretty sure that there will be a are quite a queue of TUV Independent, UUP, Alliance and SDLP councillors willing to say no on this occasion. The DUP dominate Castlereagh Borough Council, currently holding 12 of the 23 seats. However, with the loss of Iris that shrinks to 11 out of 22. No longer a majority between her resignation and a by-election. Of course, with DUP holding four seats out of the seven in Iris’ old district of Castlereagh East (TUV, UUP and Alliance holding one each), they’d need to lose a lot of votes to lose the by-election. However, if one orange bottle was to accidentally fall the DUP don’t regain the seat, and they won’t regain their overall majority on the council whenever the other parties all gang up against them. And with an increased chance – through sheer number of councillors – of other council members being in hospital or indisposed, the day-to-day majority could shrink further. No doubt it’ll be quite a fight when the electorate in Castlereagh East are given the opportunity to make their opinion known about recent events. Peter Robinson: "Please, cease and desist!" More used to writing about the adventures of Detective Chief Inspector Alan Banks on the streets of the fictional town of Eastvale, Mr Robinson has been sent condolences about his wife's behaviour. Writing on his website Mr Robinson, the pen behind the Inspector Banks novels, thanked people for the offers of sympathy, before stating the obvious. 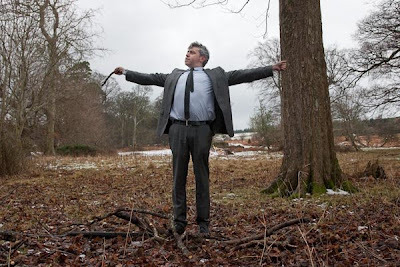 “I would have thought InspectorBanks.com would be the first clue, as would even the most cursory glance at the site, but I guess people who send rude and insulting emails or push religion at the vulnerable were not, alas, at the front of the queue when the brains were handed out. It only took a week for Castlereagh to make council and committee minutes available to the Belfast Telegraph. A week is a long time to make Word documents available … though shorter than the 20 working days - often to the hour – it takes councils to respond to requests from members of the public. Along with other local papers, the Belfast Telegraph has learned more about the tendering process for the Lock Keeper’s Inn café by going through the minutes from the Economic Development sub-committee. According to Castlereagh Borough Council’s website, there’s little evidence that they have an Economic Development sub-committee. It isn’t listed along with the other committees on their Committee page. Though one councillor claims to part of the non-existent committee. Not terribly transparent! This morning’s paper explains that a total of five people expressed an interest to run the café. Subsequent to the “Expression of Interest” being readvertised, four people responded and were asked to submit their plans to a council panel by 23 July 2008. The Telegraph report that the minutes show that “Mr McCambley was the only applicant to submit a business plan by a July 18 deadline.” The next evening at the meeting of the full council, councillors voted to offer Kirk McCambley the lease. The council fitted out the kitchen in the Lock Keeper’s Inn café after accepting “£6,338 quote from DMC Catering Equipment Ltd”. At the August economic development sub committee meeting members were told that Mr McCambley had requested that, apart from the £6,338 for essential catering equipment, the council make a “further financial contribution” towards establishing the business. The economic development manager recommended to the committee that it should offer Mr McCambley a seven-month rent free period rather than make any “further contribution”, which was worth £4,084. At the August 28 full council meeting, councillors, including Iris Robinson, voted in favour of granting the lease to Mr McCambley. They also approved all the conditions such as the rent free period and absorbing the catering equipment costs. Castlereagh Borough Council will gather at Castlereagh council’s headquarters at Upper Galwally for a special council meeting tonight to agree the terms of reference for the council’s investigation into the conduct of Iris Robinson and potentially the process of awarding the Lock Keeper’s Inn café lease. Given previous expeiences with Castlereagh it was no surprise to me that just after 9am this morning, the council’s switchboard didn’t have details of the meeting, and no one was available in the Chief Executive’s office to respond. Just in case local Castlereagh ratepayers want to start holding the council to account, I’ll update this post with a time and whether or not members of the public are welcome to attend.